At a lab on Grand Isle, La., at the edge of Barataria Bay, biologists hoping to help save the oil-soiled marshlands are at the ready with a vat containing 30,000 gallons of homegrown oil-eating bacteria. But it’s been weeks since the oil started washing up here, and still they await final clearance to begin work. It’s frustrating for the scientists, who plan to spray large sections of the soiled marsh with this microbial stew — consisting of nutrients and three naturally occurring bacteria that eat oil — to help rid the fragile ecosystem of toxic oil. This approach — known as bioremediation — is effective, especially if it is done soon after the oiling, they say. And it does less damage than some of the traditional methods used in marsh cleanup, such as burning and skimming. But getting approval from the bureaucracy assembled to respond to the BP oil spill is slower than trudging through marsh mud in waders. 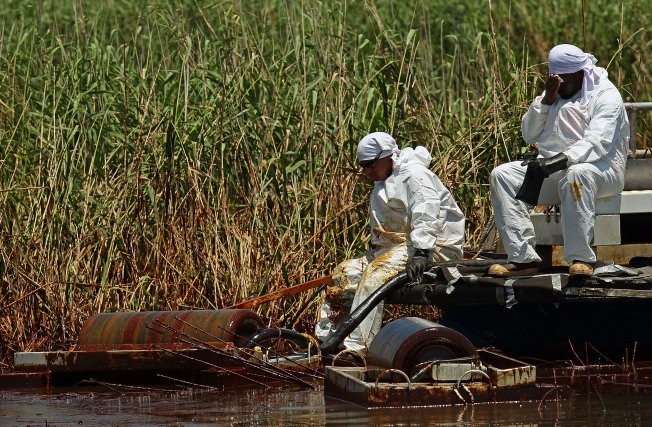 “The bureaucracy is killing us,” said Ralph Portier, an environmental biologist at Louisiana State University who started offering his expertise in marsh bioremediation shortly after the spill, and well before oil invaded the marshes on May 22. “We’re waiting for people in Washington to agree with people in Robert, La., that it’s OK to talk to a guy in Houma (La.) to tell people in Baton Rouge that’s it’s OK to do something down on Dauphin Island — or wherever. Pick your spot,” he said. In other words, after BP and federal officials at the joint command center in Robert agree on a plan of attack — which may include bioremediation or other methods — they have to seek approval from higher-ups in Washington before contacting the spill operations center in Houma and consulting with the local parish government for its buy-in. Only then can they inform the state that it’s OK to go ahead with cleaning up a given area. Getting all that to happen is tough, particularly while BP and the government are focused mainly on stopping the oil that continues to gush into the Gulf Mexico at a rate of tens of thousands of barrels a day. Budgetary concerns have also been a factor, Portier said. Though BP is expected ultimately to get the bill for the entire cost of the cleanup, the state of Louisiana is covering the cost of Portier's project for now. On July 1, the start of a new fiscal year, Portier anticipates a final approval. As the bureaucratic wheels slowly turn, Portier and his colleagues have been gearing up to demonstrate their system at sites with varying conditions. They have moved bioreactor equipment that allows for large-scale production of the bacteria from Louisiana State University in Baton Rouge to the Louisiana State Wildlife and Fisheries lab on Grand Isle. Their lab is converted from an oyster research fishery, which had to be moved away from Grand Isle when oil started coming ashore. The oyster researcher, marine biologist John Supan, is now working with Portier, who is running the project. Portier’s team has produced as much of the bacteria as they can for now — 30,000 gallons. If needed, they can produce and spray that volume of the microbial mixture each day. All that remains is arrival of boats and personnel from the Fisheries and Wildlife department. The use of oil-eating microbes to lessen the impact from oil spills dates back to the Exxon Valdez disaster of 1989, and Portier said he has successfully used them on a number of incidents, including the large Citgo oil spill in Lake Charles, La., in 2006. He is proposing a similar approach here, with adjustments for differences in conditions. He said he has also used the same approach on other types of industrial wastes — using various microbes to degrade hazardous chemicals at Superfund sites and brown fields in the middle of residential areas. Private companies also produce a variety of EPA approved biodegredation products--with proprietary formulas--based on the same principles. And the bacteria, which occur naturally, pose little risk to humans, he said. "They’re not pathogenic... They are soil bacteria," he said. For workers on the project, the need for protection is limited to "normal hygiene, wear gloves, wash your hands, wear eye shields, wash your clothes in regular Tide or something." Portier expects the microbes to not only help degrade the oil that has already infiltrated the marsh, but also to create some protection from oil that may arrive later. After the oil is gone, microbial balance will return to the habitat, he said. Oil spill experts say that bioremediation of this sort is based on sound science, but it’s just one tool that works to clean up oil in specific circumstances. Just as chemical dispersants are not intended for use in near-shore environments, where they can be toxic to plants, microbes are not used in open water, where they might deplete oxygen, harming fish and other organisms. And even within the marsh environment, bioremediation works best when the oil is a thin sheen, not a thick sludge. In Texas, where there has been extensive testing of bioremediation, outcomes were not as good as expected, said Jim Suydam, spokesman for the Texas General Land Office, which overseas that state’s oil spill efforts. Researchers concluded “you get more bang for your buck with traditional approaches — skimming, burning, separating the oil from the water physically,” Suydam said. Bioremediation, according to the state’s research, is better to use later, to “polish” the marshes after the initial cleanup is done, he said. Still, each spill is different. Oil from each spill is unique, and it takes different forms in different places after being acted on by currents, tides and weather. Handling the oil in delicate marshlands, which act as a nursery to many wildlife species in the Gulf — is especially complicated. The first order of business is to prevent the oil from permeating the ground. The loss of plant life would in turn accelerate already alarming rate that the marshland is disappearing along the Lousiana coast — estimated at about one football field every 45 minutes, according to Lopez. Alternative cleanup methods present their own risks to the marsh ecosystem, Suydam, the Texas land office spokesman, conceded. For now, Portier is eager to get to work, and demonstrate that this is the right approach, starting on Grand Isle, Queen Bess Island and north Barataria Bay — all within Jefferson Parish. Of course, the oil doesn’t respect parish boundaries. It has infiltrated some 200 square miles of marsh across five parishes. Once this project gets under way, Portier hopes to expand his work to the wetlands of neighboring St. Bernard and Terrebonne parishes as quickly as possible. He’s hoping that he will not have to start the approval process all over again. He agrees that stopping the flow of oil is extremely important, and quite naturally the focal point of the response effort, but stresses that work in the marshes is also urgent.